Our vacation home is in a very quiet area, surrounded by greenery. Our apartments are all very welcoming with all the amenities , we have a variety of accommodation suitable for families , groups of friends and older people. We are equipped to accommodate even very young children , for whom we offer free cot with linen and high chair . Offers and last minute available! Exclusive discount for low cost car rental ... and every comfort and service is already included ! Lubagnu Holidays consists of 2 buildings: a main house on several floors and an annex, obtained from the renovation of an old farmhouse traditional of Gallura built more than a century ago. Our vacation home was born from a simple idea : to create a comfortable and functional for the holidays in our beautiful island, which was at the same time in a cool and quiet away from the hustle of the city but also convenient for the beach . We provide for FREE bath towel set, bath mat, bed sheets + pillow cases, mattress covers, blankets or any bedspread, cotton and waxed tablecloth, tea towels, etc..
each unit provided with private washing machine in the bathroom or in the laundry room. fresh herbs directly from the garden! very comfortable kitchen living ! 2000 sqm/ 21500 sqft--- garden furniture and areas for relax! swimming pool reserved exclusively for our guests. Outdoor, fenced, large terrace and solarium, panoramic view of the hills and sea view. slightly salted water (no chlorine smell!). Not heated. perfect for families with very young children, couples, but also groups of friends and seniors. We also suitable for holidays ' no bathing ' in the off season , throughout the year ! Merci! Nous sommes heureux que vos vacances aient été agréables! Grazioso appartamento, ben arredato e curato, molto pulito ed ordinato; esterno curatissimo, con bella vista mare in lontananza. Contesto molto tranquillo. Spiaggia e servizi raggiungibili in pochi minuti con l'auto, in bici, o anche a piedi, per chi ama camminare un po'. Possibilità di stupende gite. Proprietari molto gentili, generosi e disponibili per ogni necessità. Grazie mille, siamo contenti che abbiate trascorso un piacevole soggiorno nella nostra struttura! We had a wonderful time in this nice apartment. We hired in late July/early August for two weeks apartment E, that is separate from the main house. The (bed)rooms are spacious and fully equipped. There is even airconditioning, which we did not use: if you keep the shutters closed during the day, the rooms remain fairly cool. Because there were four of us, the shower outside in the laundry room (with washing machine!) was very handy, and it feels like taking a shower outside. We mainly used the secluded shady terrace at the back and sometimes the spacious barbeque place and garden in front of the apartment, where the Wi-Fi is reasonable. The owners are very hospitable and helpful, they answer all your questions (in good English!) and help you right away if you need anything. There are also two bicycles for rent for a few euros per day. If you want to explore North Sardinia, this apartment in Lu Bagnu is ideal. 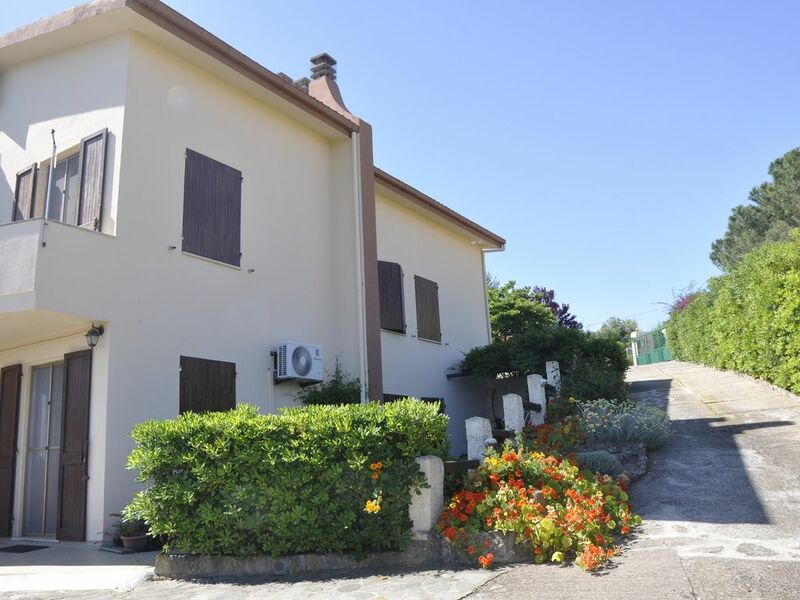 It is close to Castelsardo, an hour from Alghero, and near several beaches within walking distance. In the village there are several supermarkets, a greengrocer, a fish shop, a pharmacy, a bankomat, and various other shops, as well as some restaurants/cafés. l'équipement nécessaire et un accueil chaleureux des propriétaires qui sont toujours disponibles. Nous recommandons vivement cette location pour un séjour de qualité. Nous avons passé nos vacances 3 fois à Casa Sara et y retournerons sans doute car il n'y a rien a critiquer ! L'accueil est exceptionnel, les propriétaires adorables avec enfants et chien, la propreté et les équipements irréprochables, la situation idéale ... Bref, une très bonne adresse. we can be reached by taking the road to Castelsardo / Santa Teresa. please ask us all the directions to reach us, arriving from the airport of Alghero or Olbia , or from the port of Porto Torres ( or Olbia / Golfo Aranci ) ! We are close to beaches, but also closer to the center of the village of Lu Bagnu , where you will find restaurants, supermarkets, specialty stores , cafes with live music , etc. . we are 3 km from the village of Castelsardo , with the picturesque alleys of the old town , the castle , the cathedral and the spectacular view of the Gulf dell ... and 2 km from the Marina of Castelsardo. Tariffe solo indicative, possono essere soggette a sconti e a riduzioni, in relazione alla durata del soggiorno ed a seconda dell'appartamento, Consegna delle chiavi da parte del Proprietario (proprietario in loco). Check in su accord), check out ore 10h00. i prezzi sono consumi inclusi. Aria condizionata (quando disponibile) opzionale a pagamento. la biancheria, internet wifi e lettino/seggiolino per bimbi sono sempre gratuiti. Letto aggiunto adulto (5° posto letto) 50 euro a settimana completo di biancheria. contattateci sempre per conoscere disponibilità e prezzi.